34 Paths of Glory Generals battled for three Swiss preliminary rounds and the best eight advanced for the quarter finals and the remaining three rounds. Tom Drueding won the overall tournament with five wins and one draw, beating the up-to-then undefeated GM, Jim Falling. Jim bid a whopping four VP (the average bid being "two") to play the Allies against Drueding's Central Powers. Jim based the higher bid on the fact that a draw counted as an Allied win in the Final. Tom had also played the CP powers in the 2004 WBC finals, albeit coming in second to Nick Anner in that contest. Tom opened with the Guns of August event. (The GOA event was popular this tournament with 86% of the CP players leading with this card.) The CP took a defensive position in the West but were unprepared for an early Turn 4 entry of Italy. Although the CP did make a foray into Italy it was quickly stopped and the front settled down to the mountain line for the rest of the game. The Serbian armies held out in the Skopje mountains until the middle game with the help of Italian reinforcements. Eventually, they fell when German armies were SR'ed into the Balkans. The Balkan front made a return with the Greek Entry and Salonika events. At one point in the fighting near Salonika, a total of nine different nationalities were in the area of a six space range. Jim was exasperated when a sixth action surround attack on a German army and two corps at Monastir failed due to a 1/6 chance miss on the attack. This calculated gamble was at the expense of a BR reinforcement card, which slowed down the Allied attrition in France. Yudenitch arrived early but never got momentum to become any factor in the game. A lot of time and energy was spent in the Near East fighting with Allenby's Army which was able to break the line but never got further than Jerusalem. 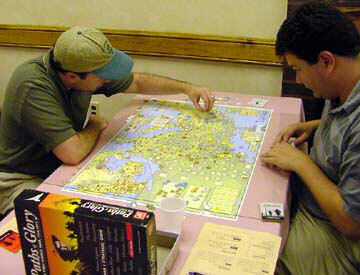 The game was decided in the East where the CP eventually concentrated their efforts to get the revolution going. Although the Russian armies quickly evaporated, the CP was helped by good card draws to get the Fall of the Tsar and finally the Treaty of Brest Litovsk off on the last turn. The CP never played either Walter or H-L Take Command and was able to cycle these "5" Ops cards through the deck very often. This was Tom Drueding's fourth trip to a WBC Finals in five years but his first victory. Jim Falling had played and lost in the 2000 Final. In the semifinal round between Jim Falling and Pete Reese, an aggressive and lucky Plan 17 attack by Jim's Allies was able to push Pete's Germans back towards the Rhine. This fit into Pete's withdrawal overall plan except for the need to play Place of Execution for war status against a French fort. Given that the Guns of August was not played as an event and that Jim was able to entrench quickly in Koblenz and Strasbourg, this meant that the CP would be mathematically unable to reach Total War status. Former champion Pete Reese offered a concession on Turn 9. This year the tournament pitted the top half of the field ranked by AREA ratings versus the bottom half. Of the 17 opening games, 14 were won by the seeded players. The three other games proved that you can't always judge a player by his AREA cover. The tournament format allowed draws and even the controversial Peace Terms rule during the prelim rounds. Of the 57 games played, Peace Terms were offered in only one game and were not accepted. There were six drawn games, which provided a better tournament point record than an outright loss for those players. Bid average 2.06 VP to play the Allied side. The victories were divided 50% between CP and Allied sides, although the Allied side won at a greater percentage in the earlier rounds. VALKYSER TRIUMPHANT IN POG: Stephan Valkyser of Germany defeated Virginian John Brown in the final of BPA's 2nd PBeM Paths of Glory tournament to claim top honors in the 68-player field. Defending champion Stefan Mecay of Texas finished third, ahead of James Pei (TX) 4th, Marvin Birnbaum (NY) 5th and Rob Hassard (NJ) 6th.